The junkboat skipper lowered his voice, though no one could be seen on the Smith’s deck. Month after month a three-mastered schooner was seen anchored off-shore in the Red Hook Flats. On board was just one man who never went ashore. How he got by was a mystery to the few folk who knew of his existence. He was not hiding; he had made his presence known by ringing the ship’s bell the many foggy nights, but he was cut off from the world without even a radio. His story, as told by Brooklyn Eagle waterfront beat reporter O.R. 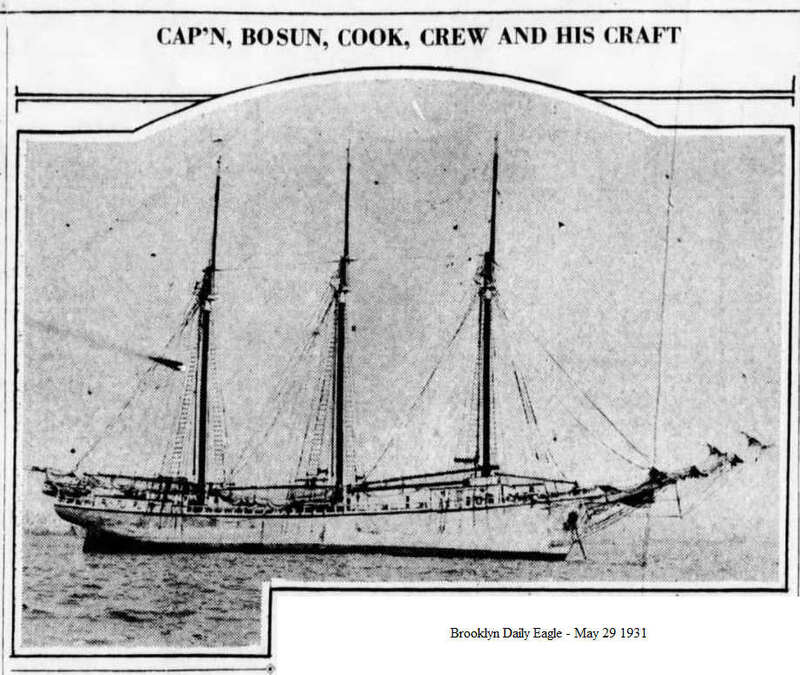 Pilot, gives glimpses into the maritime life in the waters off of Red Hook including shabby “coastwise barges” and “rusty freighters,” as well as the boats of junk dealers who traded in scrap, ship chandlers who sold provisions, and rum-runners who smuggled in illegal alcohol. She has been called the “mystery ship” of Red Hook flats. A capacious-hulled three-masted wooden schooner of the old type, she had anchored there week after week while shabby coastwise barges and rusty freighters have come for a few days visit and departed. The name on her stern reads Edward R. Smith. It could be clearly seen from the junkboat of John Bucick of 8757 26th Ave., with whom the trip into the bay had been made from the Erie Basin breakwater. A Jacob’s ladder was tossed over the side to make the ascent possible. Irving Garland, 57-7ear-old “Down-East” sailor, cook, carpenter and jack-of-all-trades, introduced himself. He apologized for the inches-long growth of his hair, explaining that barbers rarely come out into the bay and he could not leave his ship. “Well you see, Capt. Alvin McClain died. We were carrying lumber to Charleston. I was cook. We’d have a squally night.. At 4 in the morning I made some coffee for the captain. Then I heard the donkey engine start. He was getting up the sails himself. A little later out I went out and he was dead. Heart failure. What had this to do with leaving the ship? 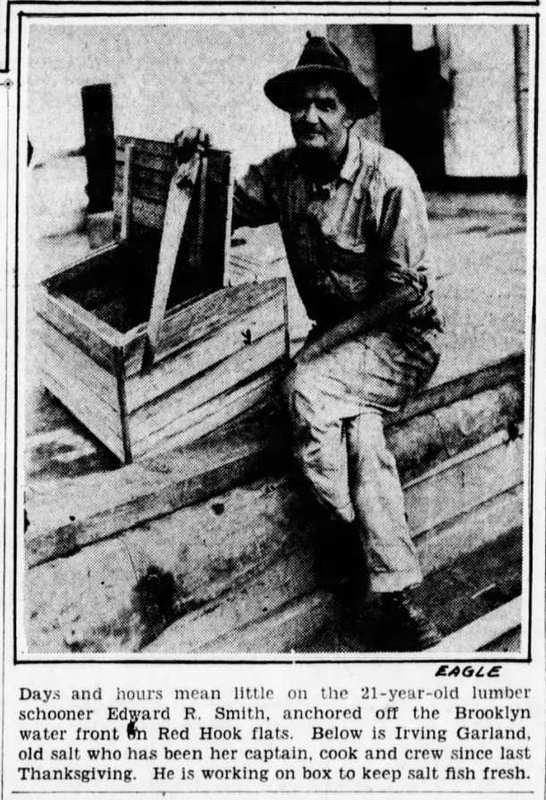 Once a month or so, he said, a ship chandler’s boat brought provisions, including chewing tobacco. He salted his own meat, used evaporated milk, had no need of ice. A man alone so long, bottles up talk. Given a chance, it bubbles up forth explosively. So Irving Garland talked, eagerly and well. “No, I never went to school much,” he said it reply to a compliment on his clear English. “You may have heard of my third cousin, Hamlin Garland, the writer. I’ve read a lot. Since I’ve been here I’ve read all the books in the ship’s library at least six times each. On and on he talked. He told why farmers age more rapidly than sailors. He described fights and fires at sea. He related how he was on the schooner John C. Hildebrand, march 12, 1928, 40 miles southeast of Shinnecock Light when the pump choked and the crew took to the boats and were rescued by a benevolent rum-runner. It came time to go. Garland had one favor to ask, which was promptly granted. 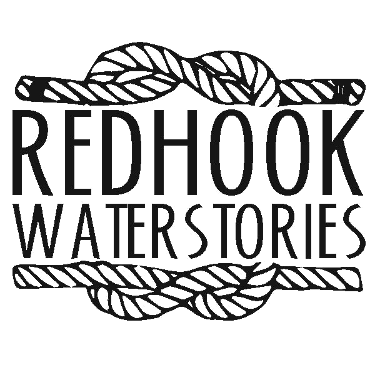 The Red Hook Flats is known as the Gowanus Flats today. It is a spot designated for ships to anchor off shore.